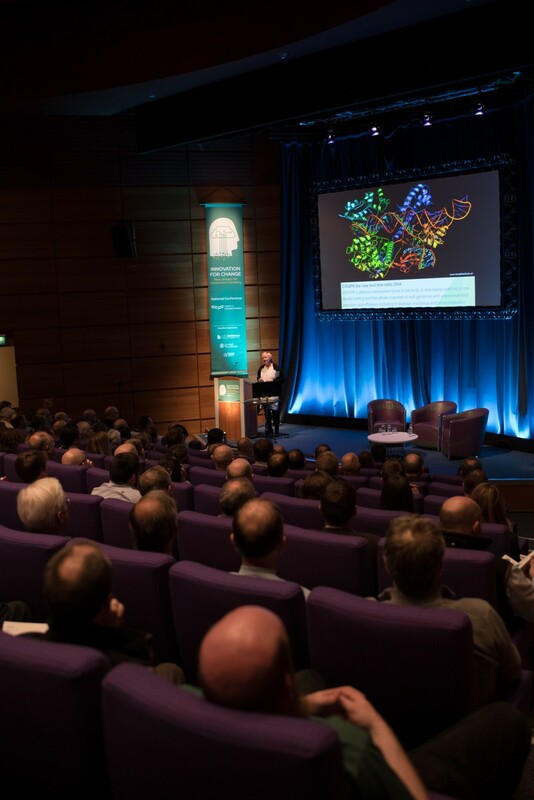 Over 330 professionals descended on the Edinburgh International Conference Centre on 2-3 May, for the Institute of Chartered Foresters’ flagship national conference. Delegates at the two-day conference on innovation heard from an exceptional selection of both UK and international speakers on a wide range of subjects setting out what the future may hold and how the forestry sector can prepare for it. The conference offered an opportunity for delegates to learn about innovation in forestry through a real mix of sessions from the power of using real time-data, biotechnology, the circular economy, radar, thermal imagery, machine learning, drones and much more. The conference highlighted that technology is an enabler for success not a disrupter. The industry should embrace technology as a key driver for transformation and adaptability. Futurologist Mark Stevenson stated “Technology is not the answer. Technology is always the question.” This powerful platform showcased the technology available to our sector including artificial intelligence, robots, augmented reality and virtual reality. Following the Cabinet Secretary, Fiona Lickorish, formerly Cranfield University, suggested tools for our industry which included horizon scanning, risk prioritisation, scenario building, stress testing and visioning. Christos Matskas, Senior Azure Developer at Microsoft, spoke about the impact of IoT landscape and cloud centric approach and what comes next. Christos advised us that there are options to improve connectivity enabling foresters to do more to utilise the cloud. Jeremie Leonard, Senior Engineer at BioCarbon Engineering showcased the power of using drones to plant trees anywhere with precision. Jeremie explained that “drones are up to 40 times faster than using people to plant trees.” John Pineau, Provincial Leader – Ontario at FPInnovations (Canada) highlighted the main challenges of developing autonomous equipment in forestry. John pointed out that we need to develop a pool of skilled people to operate one or many robots, manage robots operations, build forest robots and service these new types of machines. Professor John MacKay, Wood Professor of Forest Science at University of Oxford, explained what part genomics play in technology. On Day Two Professor Iain Woodhouse, Professor of Applied Earth Observation at University of Edinburgh, explained the benefits of using satellite radar remote sensing. Iain demonstrated that this technology can see through clouds and identify clear felling within a forest. Enda Keane, Director at TreeMetrics, demonstrated the value of real-time data to make better decisions for harvesting and marketing. Professor Dr Christian Rosset, MOTI Project Manager and Professor of Silviculture and Forest Planning at Bern University of Applied Sciences convinced the audience of the power of MOTI’s mobile app, referred to as the ‘Swiss Army knife’ for forest inventories, for capturing dendrometric variables through a live demo of basal area sweeps. Many delegates downloaded the app while he was talking. Dr Dan Ridley-Ellis, Head of Centre for Wood Science and Technology at Edinburgh Napier University exhorted us to equip ourselves for future foresters. Delegates have been left truly inspired by what the future may hold and how our industry can be prepared for innovation. Presentations will shortly be available from the Institute of Chartered Foresters’ website and photos will be available on the Institute of Chartered Foresters’ Facebook page. The Institute’s National Conference was sponsored by A.W. Jenkinson Forest Products, Scottish Woodlands and Tilhill Forestry with additional support from: 2Excel geospatial, Forest Research, Sorbus International, Trackplot, and media partner Forestry Journal.